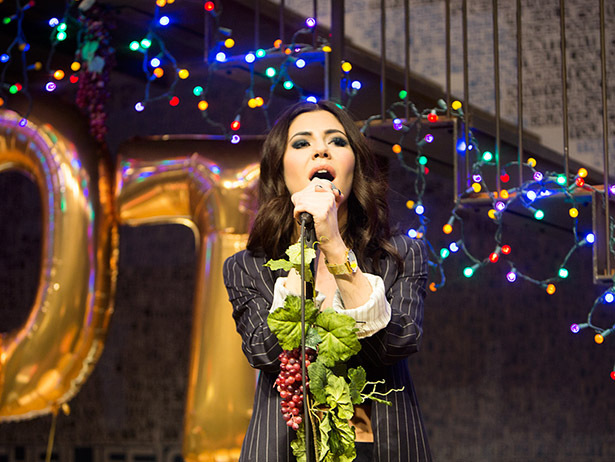 “This one feels different,” Marina Diamandis (aka Marina and the Diamonds) said, during a brief pause in her 3-song acoustic set promoting her third album Froot, due out on April. It’s clearly a very personal endeavor. Marina wrote all twelve songs on the album, and co-produced them all with David Kosten, better known as Faultline, long-time producer for Bat for Lashes and Animal Kingdom. To date, three songs have been released from Froot — the delectable title track, “Immortal” and “Happy,” with three more coming in the next two months. The album sounds much in the vein of her previous two records — lush, multi-layered, and pop-tastic — but with a distinctly optimistic tone. On “Blue” she sings over an insistent, effervescent beat, “I don’t want to feel blue.” Watching and listening to Marina, it’s hard not to catch her infectious mood. We’re counting the days until April 7th.